or before October 1, 2017, or face forceful ejection. Although they had since said that they’ve suspended the quit notice, the demands that followed the suspension, made it a nullity. It should be recalled too that shortly after the quit notice was issued, anti-Igbo songs for genocide in Hausa Language were released and circulated in the North. Those songs are still being circulated, and no one has been arrested. And there is no clear effort being made by the government of President Mohammadu Buhari to protect the Igbo living in the North in the face of real threat to their lives and property. While Nd’Igbo in the North are still in the throes of the quit notice, and the anti-Igbo songs, the Nigerian Army under Lt. Gen. Tukur Yusuf Buratai has declared operation Python Dance II in the five states that make up the Southeast. 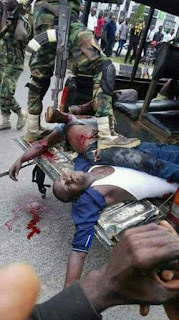 According to a press statement signed by Major-General DD Ahmadu, Chief of Training and Operations, Nigerian Army, operation Python Dance II, “has been made more expedient by the rampancy of assassinations, attack on security personnel, theft of weapons, violent agitations, armed banditry, and kidnapping.” The exercise is scheduled to take place between September 15 and October 14, 2017. No one should be deceived by the criminal activities listed above as the reasons why the Nigerian Army is conducting the operation Python Dance II in the Southeast states. It’s obvious to every keen observer that there is only one reason for this exercise. It is to primarily ‘tame’ the leader of Indigenous People of Biafra (IPOB), Mazi Nnamdi Kanu and his supporters. The heavy presence of Army personal, equipment and activities in Afara-Ukwu, Kanu’s community, since Sunday, September 10, 2017, exposes the Army on the real reason why they’re in the Southeast. They are here to implement the mandate contained in Buhari’s speech on his return from his 104 days medical tourism in London. A quick review of the list of criminal activities the Army purports to have come to check in the Southeast will show that Kanu and his group are not engaged in any. Perhaps, the Army is classifying them as engaging in “violent agitations”. But this is a case of giving a dog a bad name in order to hang it. Kanu and his group have continued their quest for self-determination in a non-violent manner. Commendably, Kanu has addressed millions of his supporters in rallies across the Southeast without a report of one individual being hurt. There are video evidences on this claim. Without doubt, the secondary objective of operation Python Dance II is to provoke Kanu and his group into violent action. This will give the Buhari government the excuse it’s looking for to commence a genocidal onslaught against the Igbo in their homeland while the Northern mob will be ready to attack the Igbo resident in the North, simultaneously. IPOB and its leadership must not give Buhari this opportunity he is apparently looking for. The core Northerners are not happy that the United Nations Development Programme named the Southeast Zone as the most human security secure zone in Nigeria. They want the Southeast to be turned into a wasteland like the Northeast. They want it to be overwhelmed with millions of internally displaced people (IDPs) like the Northeast. Nd’Igbo must not let this happen. It’s not a surprise that the Army did not include checking of the rampage of Fulani herdsmen in the Southeast. Fulani herdsmen have wreaked havoc in some communities in the Southeast. The Army has not thought it “expedient” to include in their list checking the activities of Fulani herdsmen in the operation Python Dance II. It’s a well-known fact that Fulani herdsmen have destroyed farms, killed, maimed, robbed and raped in some communities in Southeast. Rather, the Army has a list in which this serious security threat is conspicuously missing. Do they take us for fools? The Igbo and indeed all lovers of justice must see the operation Python Dance II for what it really is. It represents Boko-haram, Herdsmen, Arewa Youths, and Hausa-Fulani Advance Force in the Southeast. Deploying the Army in a peaceful region is provocative. It must be condemned and vigorously challenged, using every legitimate means.